Kazlow Jewelers  Wholesale and Loose Diamonds  Dallas - What sets us apart? What Sets Kazlow Fine Jewelers Apart? Our philosophy has been the same from the beginning: To give our customer great savings, but also to educate them so they understand what they are purchasing. This is reflected in our motto: "We work for you." We have worked hard to build our reputation of savings, customer satisfaction and quality workmanship. Thinking of getting engaged? Never bought a diamond before? We specialize in educating our customers. Come in and let us guide you through the maze of cut, color, clarity and carat. We understand a diamond is not only a financial investment, but an emotional one. We look forward to helping you make an informed choice with which you are well pleased. Kazlow's has the ability to get whatever size, shape and quality of diamond that you desire as well as GIA and EGL certified stones. We are able to bring in a large selection because we work with diamond cutters, direct importers and site holders which eliminates extra mark ups and allows us to sell at substantially lower prices. To complement our large selection of stones, we stock a sizeable collection of semi-mountings as well as hundreds of pictures of available mountings. We use modern CAD/CAM technology to create a ring from any picture or design you bring in and can make subtle or major changes to your satisfaction. Our master wax carver to handmake any design. A computer generated picture is provided of your design and an actual wax model is given for your approval before casting. All of these factors work together to provide a "no pressure atmosphere" as we work together to design a unique piece of jewelry just for you. Our policy includes upgrading a customer's single stone diamond for a larger stone and allow 100% trade in of its original price. We are always available to check and clean your purchase for life at no charge. We provide an insurance appraisal with every purchase and update it for life - also at no charge. 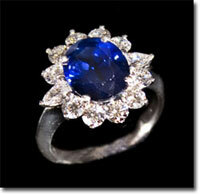 We are a full service jewelry store and also carry all precious and semi-precious stones. We can get almost all brands of watches and accessories and provide jewelry repair and appraisal services.